In October, more than 8,000 visitors poured into the Phoenix Convention Center in Arizona. 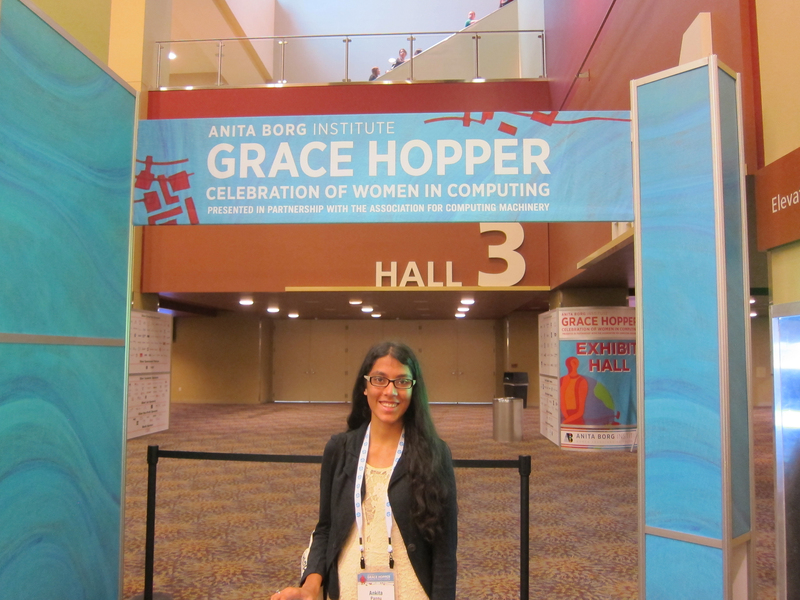 For the week of Oct. 8, the Grace Hopper Celebration of Women in Computing was the biggest show in town. Scientists, engineers, college students and faculty came from around the globe. An overwhelming majority of the attendees were female. As a rare high-school participant chosen for my research, I was honored to be a part of this intellectual mix. For three days, the convention center was abuzz with activity. While the daylight hours were filled with informational and inspiring talks, evenings mixed in “mocktails” and entertainment. The conference was kicked off by Shafi Goldwasser’s keynote address. An electric engineering and computer science professor at MIT, Goldwasser is the world’s leading researcher in cryptography, working on privacy issues in our uber-connected world. She was followed by other luminaries from the computing world: Yoky Matsuoka from Nest Labs, Linda Northrop from the Carnegie Mellon Software Engineering Institute, Lori Mackenzie from Stanford University, and many others. Personally, I thought this was two conferences in one. While much of the time was focused on how women are shaping modern technology, there was also a serious discussion around the role of society in shaping young girls, especially when it comes to STEM (science, technology, engineering and math). Ruthe Farmer, director of the National Center for Women & IT, spoke on the importance of getting girls interested in science at a young age. While some of us at Harker may not realize the problem, I agree with her when she argues that there is a significant STEM gender gap. Interestingly, a casual on-stage conversation between Satya Nadella, CEO of Microsoft, and Maria Klawe, president of Harvey Mudd College, garnered the most press. In response to a question around salary discrepancies between men and women, Nadella was “inarticulate” (as he himself later admitted), inadvertently implying that women should not be asking for raises and instead wait for “good karma” to play out. Many people in the audience, including me, were alarmed at his response. Ironically, the ensuing media firestorm may have actually helped the cause. The dialogue went national, and certainly helped in increasing awareness around the disparities between men and women in the industry. Beyond the engaging sessions, a personal highlight was the poster session. Over the last year, I have been working on research in data science. It was an honor to share my work at such a prominent venue. Hundreds of people stopped by to see my poster. They listened to my pitch. Some even hugged me and encouraged me. My project involved mining online thyroid cancer forums. My effort came about when a loved one was diagnosed with the disease. I found myself spending countless hours online, reading hundreds of “threads” and looking for answers. While these forums are valuable sources of data, searching them isn’t always simple. It was then that the thought of extracting “word-of-mouth” patient experiences came to me. By applying natural language processing techniques – part-of-speech tagging, topic modeling and association rules – I was able to develop models for discussion topics and thread summaries. I also laid the groundwork for discovering and correlating symptoms and treatments. My project ended up being a first-of-a- kind effort at mining such insights from free-form medical forums, making the data valuable to patients and health care professionals alike. After three productive days, the conference came to an end. On my flight back, I went through my collection of more than 100 business cards, and remembered meeting my new friends, all of whom shared my passion for computing. While it’s true that women are severely underrepresented in STEM, and that females make up less than 20 percent of enrollees in our engineering colleges, I sense that a revolution is underway. It won’t be long before we turn this tide. I left the event inspired to double-down on my own dreams in the field of computer science. Rejuvenated by the energy, I am also committed to bringing more females into STEM. I can’t wait for the conference registration to open next year. I hope some of you will join me there!